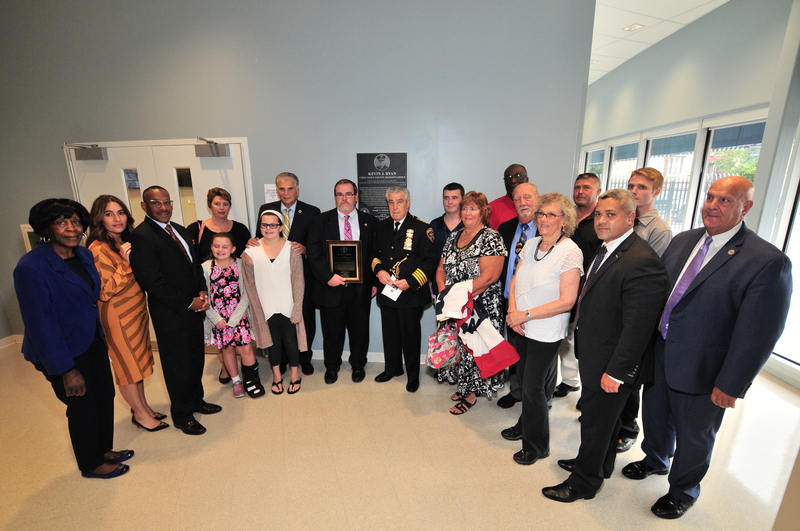 Newark, NJ – Essex County Executive Joseph N. DiVincenzo, Jr. dedicated the Essex County Sheriff’s Patrol Building in Newark as the “Essex County Kevin J. Ryan Sheriff’s Headquarters” in honor of the late Sheriff’s Chief Kevin J. Ryan. Chief Ryan, who also served as a NJ State Assemblyman and School Board member with the Essex County Schools of Technology, passed away on Wednesday, June 20th. “Dedicating the Sheriff’s Headquarters in Kevin’s honor will keep his legacy of public service alive. He was a consummate law enforcement professional who enjoyed working for the Sheriff’s Office and loved Essex County and its residents,” DiVincenzo said. “Kevin, who was recognized as a public safety expert throughout the state, had a 30-year career in law enforcement. As the go-to person in times of emergency and crisis, he was always one of the first people to be on the scene and was always ready to lend a helping hand,” he added. “This is a tremendous honor for Kevin and our family, and it’s a testament to the type of person Kevin was,” said Kevin’s brother Gerald Ryan. “He always wanted to be a police officer. Kevin had a heart of gold. He thrived at helping people and he excelled at it from an early age,” he added. Local leaders reminisced about Mr. Ryan and called the building dedication a fitting tribute. “Kevin was one of the closest people to me. He was a true cop and he loved what he did. Having his name on this building is a way to keep our friend in our memories,” Sheriff Armando Fontoura said. “The fact that Kevin served in the NJ Assembly is sometimes overlooked, but he loved having that title and he gracefully bowed out because he was a team player,” NJ State Senator and Deputy Chief of Staff Teresa Ruiz said. “Kevin had a very large extended family and it included most of the people he met. To name this facility in his honor is fitting because his brothers and sisters were members of the Sheriff’s Department,” Newark Councilman Anibal Ramos said. “Kevin was very proud to be a Sheriff’s Officer and he took his job very seriously. He was solid, sincere, loyal and had a tremendously large heart. He is greatly missed,” Newark Public Safety Director Anthony Ambrose said. “Kevin was a good person who always went out of his way to help me. I know his memory will inspire future generations of Sheriff’s Officers,” Freeholder Patricia Sebold said. “Kevin cared deeply about all ends of Essex County. He loved Essex County and serving its residents,” Freeholder Rufus Johnson said. “Kevin was a gentleman with a kind heart,” Freeholder Lebby Jones said. “My message is to his nieces and nephews and young people. Kevin left a pathway to hope and prosperity that is steeped in the epitome of public service. His name on the building signifies his sacrifice and perseverance,” Essex County Democratic Committee Chairman LeRoy Jones said. Chief Ryan began his career in law enforcement with the Nutley Police Department, where he served for four years before transferring to the Essex County Sheriff’s Office. He worked his way up through the ranks becoming an Undersheriff and then a Chief, and worked in virtually every area of the department. His most recent responsibilities included supervising the Field Operations Division, which includes the Patrol Division, the Bureau of Narcotics, the Bomb Squad, the K-9 Unit and the Office of Emergency Management; and the Fleet Management Unit, which includes all marked and unmarked sheriffs’ vehicles, and a wide variety of specialized vehicles and equipment utilized for patrol, undercover surveillance, emergency management and homeland security operations. Frequently he was assigned to represent the Sheriff’s Office on a multitude of task forces with the Federal Bureau of Investigation, the Federal Bureau of Alcohol, Tobacco and Firearms, the Federal and New Jersey Departments of Homeland Security, the New Jersey State Police and the municipal police departments of Essex County. Chief Ryan also supervised the Dignitary Protection Detail which provided security for Pope John Paul II; Presidents Bill Clinton, George H.W. Bush, George W. Bush and Barack Obama; numerous heads of state; governors; senators and other visiting dignitaries, and served as special assistant to Cardinal Joseph Tobin (and the Cardinal’s predecessors) supervising and securing His Eminence’s personal safety as well as congregants who attend Mass and other functions at the Cathedral Basilica of the Sacred Heart in Newark. He began his career in public service at the age of 15 working as a voluntary aide to NJ Senate President Carmen Orechio, eventually being promoted to a senior staff position. He later served as a NJ Assemblyman from 2010-2011 and as a school board member with the Essex County Schools of Technology since 2006. Throughout his career, he received numerous awards and recognition, including being bestowed the honor of Knight of the Equestrian Order by Pope Francis I on November 16, 2016. Members of the Sheriff’s Office have memorialized Chief Ryan by naming his parking space outside of the Essex County Emergency Management Office in West Orange.